Williams College astronomer Jay Pasachoff captured this view of a partial solar eclipse from Tasmania on July 13, 2018. You probably didn't see Friday's (July 13) partial solar eclipse, but you can get an eyeful of the celestial event thanks to a photo by veteran eclipse observer Jay Pasachoff. 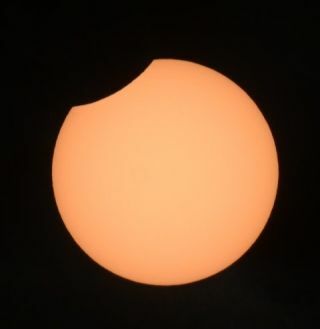 The eclipse was visible only from Tasmania, portions of the southern Australian mainland and the extreme southern portion of New Zealand (as well as a patch of the Southern Ocean and a stretch of northern Antarctica, but penguins and leopard seals presumably didn't crane their heads skyward). Pasachoff, an astronomer at Williams College in Massachusetts, snapped the new pic from the University of Tasmania's Mount Pleasant Radio Observatory. From this location, the eclipse lasted 64 minutes, and the moon covered just 10 percent of the sun's disk at maximum, said Pasachoff, who has now observed 68 solar eclipses during his long career. The next solar eclipse is less than a month away: On Aug. 11, some folks in northern Europe and northeastern Asia will be able to see the moon blot out a portion of the sun's face. Another partial eclipse will be visible from the northern Pacific and northeastern Asia on Jan. 6, 2019, according to NASA's solar-eclipse website. The next one after that — on July 2, 2019 — will be a total solar eclipse, a spectacular event during which the moon completely covers the sun. Totality will be visible from a narrow band of the planet's surface that runs from the South Pacific through Chile (where Pasachoff plans to be) and Argentina. Much of South America, and parts of Central America, will be treated to a partial eclipse on that day. The July 2019 event will be the first total solar eclipse since the highly anticipated "Great American Solar Eclipse" of August 2017, which thrilled skywatchers from Oregon to South Carolina.